Bree van Reyk: World of Sound | Yeah nah. I made a trip to Carriageworks this evening to check out percussionist Bree van Reyk‘s new project, part of Performance Space’s Liveworks Festival of Experimental Art. The Festival runs for a couple of weeks and features experimental art across a range of disciplines; while I was there I saw a dance and video piece about drones and surveillance. I was there, however, to see Wall of Sound, which is part of the Festival’s series of free events. Van Reyk has described the event as “solo me, solo you, solo gong”, and it’s pretty apt. It’s a one-on-one situation, two people and a sound. Before entering Wall of Sound I had to wait as a couple of people were already in line for the experience. I was given a little spiel while I waited, about what to expect and how to proceed. As I stood there, percussive waves echoed down the hallway, through the obscuring curtain. It was dark, so it was a suitably hermetic-feeling experience. After a couple of minutes it was my turn. The curtain was held back and I moved towards the empty stool at the end of the corridor. 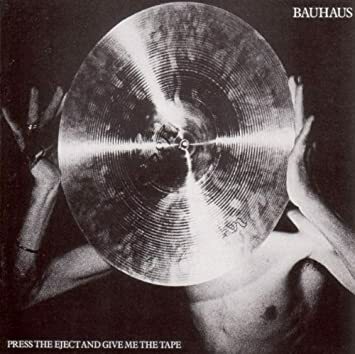 Van Reyk sat, beaters upon her knees, mostly obscured by a large wind gong, appearing partway between tarot imagery and the cover of Bauhaus’ Press Eject and Give Me the Tape. A light shone on the instrument, recalling a sun, a golden disc. I sat on the stool in front of the gong and placed my hands on my knees. The gong hung between the two of us, with only knees and feet visible. I’d been told that the instrument could get very loud – I drum, so I know how loud cymbals can be, and this was another order of magnitude – but I was determined my hands would stay on my knees, not my ears. Van Reyk lifted the beaters and the exchange began. Slowly, the gong began to swing in space, left and right edges approaching and receding. The makers’ marks moved in and out of focus, and the central circle shimmied across my vision. Pits in the instrument came and went as the light caught them, and as the motion increased the metal divider between player and listener became a molten wall, fine-edged and undulating. Gently, two-hit beats became audible. Softly at first, then more insistent. The movement of the gong created weird phasing effects, and though I couldn’t see how it was being played, different sounds – still simple, at this point – made themselves known. While I had been waiting the sounds of the gong had seemed more traditional – wash and crescendo – but seated in front of the instrument there was more nuance. More evocation. There was a distinct sense of the cosmic, in the manner pursued by explorers such as Popol Vuh: a definite kosmische musik language of burnished, singing suns and grinding time. Certainly, my perception of time was distorted; though I knew the performance was a five-minute affair, it felt alternately much longer and much shorter. There was no enormous crescendo to end the performance I witnessed, as I’d heard while waiting. Mine ended with a plateau, then a slow diminishing figure, a stealing in of entropy. I sat in silence for a few moments, trying to capture the last moments of decay, the death of the piece. In the edge of my vision, I saw the beaters return to van Reyk’s knees. The wall was still once more, the division once again in place after a moment of unity. I stood, quietly thanked her, and walked back down the corridor towards the black curtain. It seemed longer this time, somehow. I turned out to be the last participant in this first session of Wall of Sound, before a half-hour break. Walking through Carriageworks’ darkened spaces a few minutes later, I passed by the performer, as she left her spot for her break. I wondered if she recognised my shoes. It felt strange, having had quite a personal yet guarded experience with a musician, and to pass in a corridor unremarked. I imagine this event is going to be booked out rather quickly. It’s a simple, yet unique experience, and one worth pursuing. It’s not often you’re given an example of musical mindfulness – the concentration on exactly one thing, completely. But Wall of Sound does just that: places you in a chamber of metallic waves, created for you alone. It’s a capsule of personal music, both simple and complex, and greatly recommended.